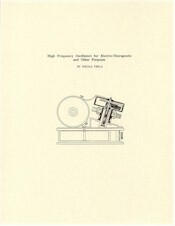 A companion piece to Nikola Tesla: Lecture Before The New York Academy of Sciences, this paper was read in absentia before an 1898 meeting of The American Electro-Therapeutic Association. It provides additional information about the construction and use of Tesla's New York oscillator as well as other smaller devices. Also included are comments on possible applications for HF currents by the medical profession and Tesla's personal observations of the effects "when a person is subjected to the action of such a coil."